SPOILER ALERT: This interview contains information on critical plot developments on the second series of 24. 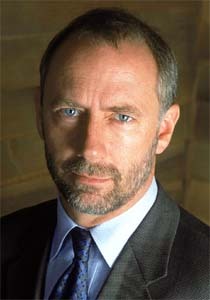 Xander Berkeley has a reputation for playing men of ambiguous character. He has starred in countless movies including Air Force One, Apollo 13, Candyman and Terminator 2: Judgement Day. 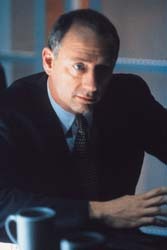 More recently he has portrayed the role of George Mason in the series 24. 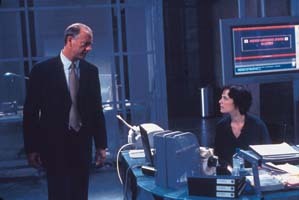 In September 2002 he married his co-star on 24, Sarah Clarke, who plays Nina Myers. In the new series Mason is in charge of CTU's Los Angeles bureau, having inherited Bauer's office. 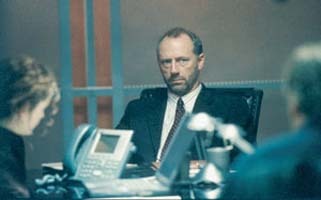 Sci-fi-online caught up with Xander Berkeley as the second season of 24 was about to start on BBC2. Darren Rea: What was it that first attracted you to the role of George Mason in 24? 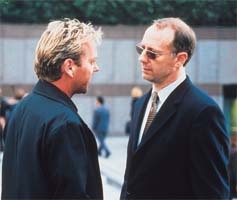 Xander Berkeley: I have to confess to pure ignorance on my part on what I was getting myself into. But that's how things work out sometimes. There was a writers strike and it looked like production on a lot of movies would have to be shut down. I wasn't sure whether this would last for some time, as these strikes have in the past, so I thought I'd better make hay while the sun shines so that I could go travelling. So I severed the tether, justifiably, from Los Angeles for a little while. At this time a number of pilots were being cast. Because these shows spent so much time and effort ensuring that the lead actors are just right for the role a lot of shows are keen to offer guest roles to known movie actors. I received two offers for roles on the same day and because the dates were different I worked out that I could record both shows and then get the hell out of Dodge. When I first read the script for 24 I thought I was playing a different character. It wasn't until I turned up on the set that I realised that I was playing Mason and I thought: 'Oh God! I'm playing the prick! I'm tired of playing the pricks. So what do I do with this one?' So I gave him a bit of rye humour and a little cynical detachment and they enjoyed writing for the character enough to bring him back towards the end of the show. I'd been reluctant to do a TV series for a long time, just as I'd been reluctant to get married and I ended up doing both with this show and it's turned out to be a fabulous surprise. You are well known for playing heavies as well as "pricks" are these roles you are keen to distance yourself from? And when people met you in the street how do they react to you? Sometimes people give me a wide berth and security guard watch me closely in department stores [laughs]. It's just one of those things that happens in Hollywood. I try to do variations from one role to the next, but it could be worse. I don't want to play some bland guy, you know some putty in the crack plot pusher - that's not terribly interesting, so you want to play some guy who has at least some kind of function to the centre of the story and if it's not the hero it is going to be the bad guy. The great thing about 24 is that his character started off one way and as the series progressed he revealed a number of hidden layers. And the writers have ended up redeeming him and turning him into a heroic guy. And I understand that series two will see your character becoming more heroic. Is it true that you will spend a great deal of the series dying? Oh, really? This bloke knows more than he ought to! Shame on you! [laughs] Don't let it out for the audience [laughs].All that anyone knows at this point is that there is a nuclear threat in Los Angeles and, you know this so I can tell you this much, that at one minute you think I am desperately trying to get the hell out of Dodge, like a coward and the next minute I find myself in a fire fight. This involves airborne plutonium. As an actor how do you prepare to play the role of a dying man? Well, you read a lot about what happens to someone who might have been exposed to plutonium inhalation. Also the writers have had to be on top of things because apparently there is a 12 hour window before the symptoms start to show themselves, so you don't want the audience to forget. Also you don't want it to become morose and you don't want to play it in a self pitying way because the guy never came off as someone who was particularly wet and self pitying. He ends up having to resolve a lot of things and becoming very heroic. What do you think it is about the show that makes it so popular? Do you think the events of September 11 have focused the publics attention more on the threat of terrorists and that a look at how a counter terrorist unit may operate is reassuring to the the public? I'd hate to think that it is because of 11 September that people are interested. You could also make the argument that after those horrific events people don't want to think about those things. In fact, that was a major concern we had about the first season just before it aired. Things had to be edited, especially scenes with the plane. And, while we weren't dealing directly with terrorists last year, there was an element of it because it was centred around a counter terrorist unit and there was a terrorist plot against a presidential candidate. In season two, instead of stepping away from it they went into the centre of it and that was something else that we thought might have backfired. But the choices they have made have consistently paid off. It's something that people need and want to be more informed about because it does affect our personal lives. When you are filming is it always at the back of your mind that this is supposed to be shot in real time? There must be a lot of continuity issues. How does this differ to other programmes and movies you have been involved with? I keep going back to the same set and wearing the same clothes which helps focus me on the fact that it is still the same day. I am never sure at what point my stubble is supposed to be at - because obviously as the day progresses you should start to see stubble on all the male actors. So tracking things like that helps you constantly remember that this is still the same day. Beyond that there are the subtleties of just how exhausted these people would be at one moment and then driven by adrenaline the next. Actually we were on our honeymoon when the premier was held in September, so we actually missed that. But I still want to see that very much. With the advent of DVD lots of movies are being reissued with additional material, but having a movie re-released through IMAX is pretty unusual? I was fascinated to see it in that format, because it is such a visceral way of telling the story and I love the IMAX format. I also went to China a few years ago to do an IMAX movie [China: The Panda Adventure]. I went straight from doing Time Code - which I think 24 borrowed a lot of its stylistic format from - to work on China: The Panda Adventure. It was just great travelling in China. After being in a film that was one quarter of a movie screen, I thought it would be a good transition to go to a 105mm format. Isn't it a little unnerving seeing yourself blown up so big? Oh, yeah [laughs]. Very much so. 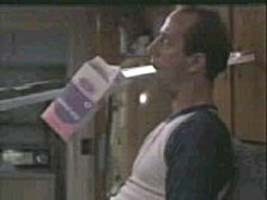 But I'm looking forward to seeing how Apollo 13 looks. I remember seeing you play John Conner's step father in Terminator 2 and being impressed by the make-up in the movie. Isn't it true that when you meet your end in the film it is a make-up effect and not, as most people think, a computer effect? Yeah, that effect was done laboriously and painstakingly with a cast of the back of my head and a blade that comes out. It was not a digital effect. It was a total physical effect with puppetry and a blade that could contract. There was a small blade going out of the back of my head that retracted sideways away from the kitchen cabinet at the same time as the blade that was down my throat was pulled out. The problem was that the blade had to be far enough down my throat to look as though it was coming out of the back of my head. To get this right I had to practice sword swallowing for two weeks. So I'm on set with this blade sticking out of my head and another one down the back of my throat when they decided at the last moment: "I wonder what would happen if we ran a tube of milk and a tube of blood down either side so that when the blade is pulled out you can see blood and milk dribbling from my mouth". So they tried this and it looked so horrifically awful - it just turned into one pink stream of liquid - that they had to split the two at the back of my throat. I gagged and the whole experience just about freaked me out. And we had to keep redoing the scene because they couldn't get the calculations right and I was leaned back against this cabinet, which was not comfortable. So, the whole thing was a nightmare until about five in the morning. I was laying dead and was not able to move because first they have to get the puppeteers for the arms and the wires and the silver guy. Then they had to get Robert Patrick walking out of frame and if I moved I'd have ruined the whole shot. There's a bunch of things. Sarah, who plays Nina on 24, and I got married in September and we were able to do two movies together in the summer. 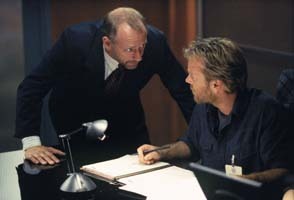 And I've just done a movie called U-Boat with Willam H Macy. What would you say is the work that you are most proud of? Difficult to say because I love different genres. In the sci-fi genre Terminator 2 and Gattaca are two of my favourites. Sid and Nancy is still a favourite of mine and I think the movie still holds up. I think Air Force One is a great action movie and I enjoyed working on that. And I also had a great time working on both Apollo 13 and Shanghai Noon. Are there any directors or actors that you are keen to work with? Yeah, there's a lot from both categories. I can't help but have my sites set on Scorsese, Cohen Brothers and Spike Jones. If you weren't involved in acting what would you be doing? I want to direct films, because I am a painter and a sculptor and I've done a lot of writing. And directing is the ultimate way to bring together all the art forms I've been involved with over the years. I've done a lot of special effects make-up on the side oddly enough.